This morning I enjoyed a La Vigne Lemongrass chocolate* from John and Kira's (Philadelphia, PA). 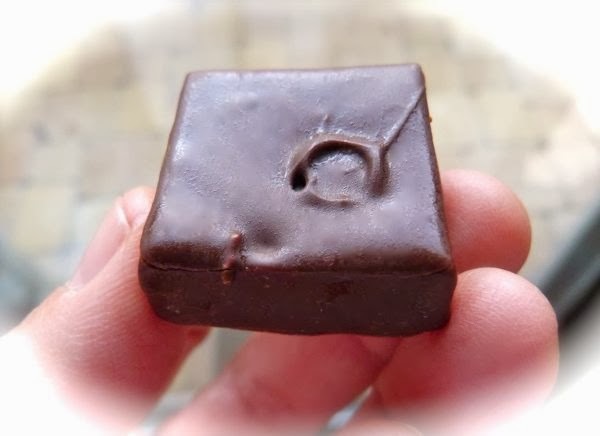 This dark chocolate covered square contained a ganache (filling) subtly flavored with "organic and biodynamic lemongrass from Helen and Robert Beck's California farm." Dark chocolate was the dominant flavor, and as I savored the chocolate, the lemongrass revealed itself slowly and wonderfully. I love natural, botanical flavors like this. I would have been happy with even more lemongrass flavor, but I suspect this subtle hint is to many people's liking. Today was Day #3 of Chocolate and Lemon Theme Week. Note: The La Vigne Lemongrass chocolate was part of a 15-piece "Every Flavor" assortment box, and was not sold separately.